Her Majesty’s Courts & Tribunals Service (HMCTS) has updated the N5B accelerated possession claim form. The N5B form is used by those seeking possession of a property let under an assured shorthold tenancy on the expiry of a Section 21 notice. The process is referred to as accelerated because the court usually makes an order for possession without a hearing. However, the old form had long been considered out-of-date because it failed to address the changes to the validity of a Section 21 notice introduced by the Deregulation Act 2015 and Housing (Wales) Act 2014. If Yes, state the license number? Had the landlord appointed a licensed agent to be responsible for all the property management work in relation to the dwelling? Was a money deposit received in relation to the tenancy or in relation to a tenancy directly or indirectly replaced? On what date was the prescribed information given? When was the deposit lodged? Has a valid EPC been given free of charge to the tenant? Has a copy of the gas safety record been given to the tenant? Has the tenant been given a copy of the then current document ‘How to Rent: the checklist for renting in England’? The new form must be used by those seeking possession through the accelerated route now and certainly for those assured shorthold tenancies that commenced on or after 1 October 2015. 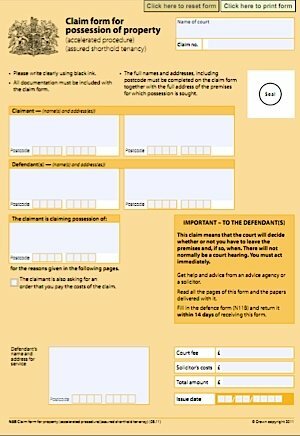 Those issuing their claim form in Wales will need to use form N5B Form Wales. At High Yield Property Management we aim to provide landlords with a low cost fixed price property management solution for just £50.00 per month and a tenant find service for just £150.00 without compromising on our exceptional levels of customer service.